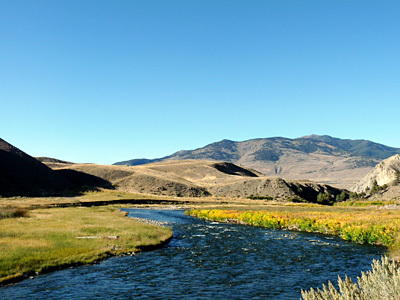 Question: I’m heading to Yellowstone National park in late July to fish. I’d like to get off the beaten path and avoid the crowds. If I had to choose between big fish and solitude, I’d choose solitude every time. Any advice? Hidden Yellowstone streams and lakes — with fantastic fishing — are often just a short hike away from the crowds. Carolyn Conner photo. Answer: Well, if you want actual solitude, you’re going to have to hike into the backcountry. Pick up a copy of The Yellowstone Fly-Fishing Guide (Lyons Press, May 1997, 176 pages) by Craig Mathews and Clayton Molinero. Mathews, proprietor of Blue Ribbon Flies in West Yellowstone, is one of the foremost authorities on fishing in the Park. However, there are some places that are less crowded than others. When I guided in the park, one of my favorite places to take clients was Cascade Lake, accessible via a 2-1/4-mile hike off the Grand Loop Road just north of Canyon Village. The lake holds small cutthroats, but the big attraction for me was the population of eager grayling willing to eat flies. The lake itself is set in a beautiful spot, and you’ll often see elk, ospreys, and grizzlies(!) in the area. Pay attention to the bear warnings at the trailhead, and never travel off the road without bear spray. Source #1: Blacktail Creek, on the way to the Black Canyon of the Yellowstone, is good for brookies, and the Black Canyon will still have big stoneflies at that time of year. (As well as grizzlies and rattlesnakes.) Crawdad Creek, a mile from the South Entrance, has a bunch of little Cutts. Source #2: The Bechler River. This drainage is protected by some of the most fearsome mosquitoes and deerflies I have ever encountered, but it is a beautiful area with interesting fishing and good trail access. Don’t say you weren’t warned about the biting flies. Source #3: Technically, it’s not in the Park, but I would fish Hebgen Lake. Lots of big fish, and it’s pretty hard to feel crowded when you find the right spots. Although bear attacks are rare, they do happen, and anyone who ventures into bear country needs to be prepared. Here are some excellent tips for avoiding dangerous encounters.